Teammates release their LEGO robot during last year's Iowa FIRST LEGO League State Championships at the College of Engineering. Larger photo. Photo courtesy of Iowa FIRST LEGO League. AMES, Iowa – This is not your average, multiple-choice school challenge that students across Iowa have been facing this school year. “Sending people into space is one of the hardest challenges humans face,” says the project assignment for this year’s FIRST LEGO League global challenge for teams of 9- to 14-year-olds. The challenges of space travel are many: How do you survive the extreme temperatures? How can you find air, water or food? What do you do about waste disposal? How do you stay healthy and fit? What about loneliness and isolation? 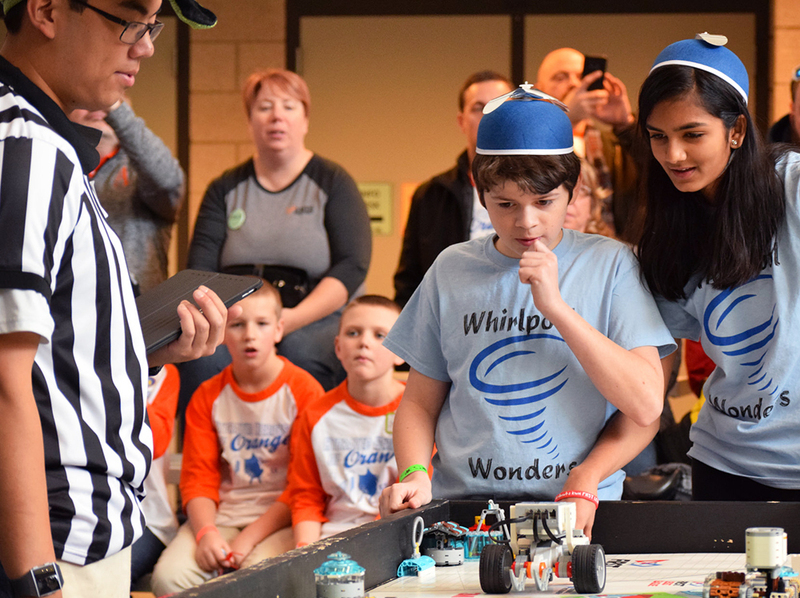 Those solutions will be on display Saturday and Sunday, Jan. 19 and 20, as 60-plus teams from around the state meet each day at Iowa State University’s College of Engineering for the annual Iowa FIRST LEGO League State Championships. The action – including research presentations and a robot game – will be from 9 a.m. to about 4 p.m. both days. Opening and closing ceremonies plus robot action will be in the atrium of Howe Hall. Nominated teams presenting their research for the event’s Global Innovation Award and teams of 6- to 10-year-olds in the FIRST LEGO League Junior program will present in the atrium of the Biorenewables Complex. All events are free and open to the public. You’ll find cheering students in funny hats. You’ll find demonstrations of the event’s philosophies of “gracious professionalism” and “coopertition.” You’ll find LEGO robots the students have assembled and programmed to complete simulated space tasks, including setting an array of solar panels, crossing a crater and deflecting meteoroids. You’ll also find Tomas Gonzalez-Torres, an Iowa State senior lecturer in aerospace engineering and former flight director for NASA, speaking to students about the space missions he helped lead. And mostly you’ll find bright students getting excited about science, technology, engineering and math. This year’s Iowa FIRST LEGO® League sponsors are the Iowa State College of Engineering, John Deere and Collins Aerospace. FIRST LEGO® League is the creation of FIRST, a nonprofit organization based in New Hampshire dedicated to inspiring young people to explore science and technology, and the LEGO Group, the Denmark-based toy manufacturer. Hundreds of Iowa school students will show off their research and robotics skills during the annual Iowa FIRST LEGO League State Championships Saturday and Sunday, Jan. 19 and 20, at the College of Engineering. Events are 9 a.m. to about 4 p.m. both days and are free and open to the public.